Prices of rice, vegetables and iftar items in the markets of Dhaka city are relentlessly sky-rocketing as people wait in vain for the government to intervene. Opposition political activists jumped at this opportunity to demonstrate against the government's failure by holding rallies and processions throughout Dhaka on Sunday, October 17. 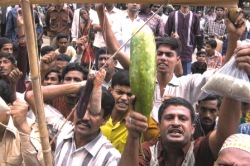 Jubo League activists carried some of the priciest vegetables throughout the rally. The police intervened on Bangabandhu Avenue with clubs and dispersed the crowd. At least a dozen Jubo League activists were arrested during the protests. Opposition activists are planning more anti-price hike rallies to protest the government's lack of action. Commerce Minister Altaf Hossain Chowdhury explained to the media that after three days of sunshine, millers would be able to dry their paddy stocks, which would therefore lead to the lowering of rice prices. His theory, however, proved to be flawed, as rice prices are still on the rise. Shoppers all over Dhaka are finding it harder and harder to buy their daily goods, and appeal to the government for help. When asked about government intervention, Commerce Secretary M Aminur Rahman said that although the government was planning to sell goods at subsidised rates under an Open Market Sale programme, they were hesitant to "take any drastic action as it may send a wrong signal to the traders." The wrong signal that the government is giving the rest of the country by allowing traders and hawkers to rob the people blind without taking any action, is unfortunately of no consequence or importance. While the government's one-member judicial commission has mysteriously announced the involvement of a foreign country in he August 21st grenade attack, the inspector general (IG) of police has said there is no such international link. At the 73rd Interpol General Assembly in Mexico on October 7th, the IG Shahudul Haque said that the few bomb blasts that have occurred were carried out with locally made bombs. But he did admit in the speech that the culprits behind any of the bomb blasts or grenade attacks have not been found. For some strange reason the IG did not specifically mention the deadly grenade attacks in Sylhet and Dhaka which were carried out by foreign-made grenades. But he did claim that Interpol, FBI and Scotland Yard were all helping in the investigations of all bomb and grenade attacks since 1999. This is not true since the government itself has announced that Interpol and the FBI would be assisting local intelligence agencies in their probe into the August 21st grenade attacks. The government also said that Scotland Yard would help prove the grenade attack on the British High Commissioner on May 21st in Sylhet. For the public all this is very confusing. The IG did, however, say that there were a few terrorist groups operating in Bangladesh under the shelter of some political parties. Haque sought international efforts to combat organised crime that goes beyond borders. Out of the 53 private universities swarming the streets of the country, especially the Capital itself, an eight-member high-powered committee has recommended shutting down eight for violating rules and regulations. The committee headed by its convenor Dr M Asaduzzaman, chairperson of the University Grants Commission (UGC) submitted its report to the prime minister yesterday, according to BBC radio. The committee, through its evaluation of the institutions' performance, has revealed that 18 universities do not follow the government rules, while performance of 10 of them was satisfactory. These universities have also been given different deadlines of two and one and a half years to meet the requirements. According to Prof Asaduzzaman the UGC had recommended a fixed deposit of Tk 5 crore, employment of 80 percent full-time teachers and determining tuition fees in line with the country's socio-economic perspective. However, it seems that the private universities are not complying with the rules and regulations and most of them have already withdrawn the Tk 5-crore fixed deposit. "A few universities are functioning well. But most of them are run by only part-time teachers with miserable academic programmes," said Prof Asaduzzaman. Some of them have also opened departments, which have no students at all, he added. The Education Minister Dr Osman Faruque said that the recommendations made by the UGC would be reviewed and that effective measures would be taken. The committee has also recommended setting up of an independent accreditation board and introducing amendments to existing laws, to oversee private universities. According to an AFP report, most of the Asians are not very happy with President Bush and want him voted out of office in the November elections. Most people have a negative view of Bush's US-led war on Iraq, not just in the Muslim dominated countries such as Malaysia, Indonesia and Pakistan. Surveys show that in Japan (which has sent troops to Iraq), around 80 percent of the people oppose the war and an online poll showed 56 percent of the respondents favoured Kerry while 21.5 percent favoured Bush. In many Asian countries, Bush is favoured by conservative business leaders and seen as being strong on economy, while Kerry scores more highly with the public, media and intelligentsia on international issues. Filipinos too like Bush because of his strong stand on international terrorism. Philippines has been attacked several times by Al-Qaeda- linked militants. India seems apathetic towards either candidate while Vietnam favours Kerry because he has played up his military service in Vietnam.